The following recipe makes 4 fish cakes. • 150g mashed potatoes. (Approximately 2 medium potatoes). Mashed and left to cool. The mash in this Mashed Potato post would work well. 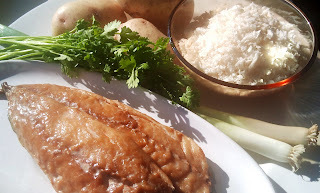 Mix the cooled mashed potatoes, fish, onions and coriander together and mix well. Divide into four then shape into four fish cakes. In a small bowl, add the milk to the beaten egg and mix together. Heat a large frying pan on a high heat. Next, dip the fish cake in the egg/milk mixture and then into the bread crumbs. 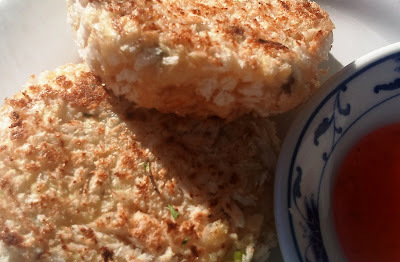 Pat the bread crumbs on the sides of the fish cake to ensure they are well coated. (If you want them extra crunchy, you can now dip the fish cake back into the egg and then back into the breadcrumbs. You might need a second egg if double-dipping). Shake lightly to remove the excess. Add the sprays of oil to the pan and add the fish cakes. Re-shape the sides of the fish cakes when they are in the pan. If they are a little thick, you can pat them down gently with a spatula. Let them fry for approximately 5-8 minutes turning carefully several times. Reduce the heat in the pan to low when the fish cakes are sufficiently browned. Remove the fish cakes from the pan and allow to rest on kitchen paper to drain before serving. Serve with sweet chili sauce on the side.